Huh - it's amazing what a difference a month and a half can make. I got home from work tonight exhausted and not at all in the mood to cook. I've had a cold for the past 2 or 3 weeks, and I can't remember the last time I went grocery shopping. It pains me to admit it but I've probably ordered more delivery in the last 2 weeks than in the whole year before that. So, I figured tonight would be another night like that. But after a refreshing shower, I had a little more energy, so I started digging around in the freezer, and I came across a ziploc bag of individually-frozen sweet potato gnocchi. I had even written a note to myself that there were 2 servings worth in there. Score! In the fridge, I found a tiny bit of leftover tomato sauce with basil from Raffetto's, just enough for one meal. I cooked half the bag of gnocchi in a pot of salted water, heated up the sauce in a small skillet, and transferred the gnocchi over to the warm sauce when they were finished. Only when it was all mixed together did I stop to think - sweet potatoes and tomatoes? What was I thinking? What would that even taste like? I've had plain potato gnocchi with tomato sauce before, but sweet potatoes have a much stronger taste, and suddenly I was nervous. On top of that, the gnocchi had been kind of disappointing the first time around, so... it was with a good deal of trepidation that I took my first bite. And it was so good! Maybe it's because this was the closest I've come to a home-cooked meal in a long time; maybe it's because enough time has passed since I first made the gnocchi that the struggle that went into them is a distant memory; maybe it's because I managed to convince myself that the gnocchi were only barely edible last time. And who knows, maybe it's because I'm still sort of congested and my taste buds are not operating at their full capacity. But whatever the reason, tonight those gnocchi were downright delicious. They were soft and yielding, melting perfectly into their saucy red tomato bath, and now I'm really excited about the single serving left in that freezer bag. Does this mean I'd make them again? Uh... probably not. But at least now I can look back on my gnocchi experiment as something of a success. Well hello there. I have a question for anyone who might be reading this who has a food blog of their own: how do you decide if something is blog-worthy? Does a dish have to come out perfectly? Do you make it multiple times before posting? Would you post it with less-than-stellar pictures? What if it's a simple dish that other people have done better? Or something you threw together that came out really well, but you don't have a real recipe for? These represented my first attempt at gnocchi, and I made things harder for myself by adding sweet potatoes. I started by roasting 2 lbs of potatoes, of which about 2/3 were sweet and 1/3 were Yukon Gold. Then I mashed them, added flour, a pinch of salt and a pinch of nutmeg, and rolled them into ropes. (Ha! Sounds so easy now... the flouring and rolling took forever, and made a HUGE mess.) They went into the fridge for about half an hour, at which point I rolled them on the back of a fork. Half of them went into the freezer and the other half went into a pot of boiling water, and then into a saucepan with sage and brown butter. I finished them with a dusting of parmesean cheese, and then I dove in, and they were... respectable. But I don't know if I'd call them "good." I looked at this as a learning experience, and I definitely learned, but I also came out with gnocchi that were just a little leaden in the middle. Like David Lebovitz, I found that brown butter and sage went a long way towards making the gnocchi enjoyable, and like him, I would say that my final result was a success. Next time, however, I think I'll go back a step and try the plain potato version, or maybe ricotta gnocchi, which don't even need to be rolled all fancy-like. I've made that kale on toast dish quite a few times since I originoally posted it, but with a bunch of kale nearing the end of its shelf life and no bread in the house, I needed something else to do with it. I decided to make a very rough pasta sauce by sauteing it with some onions and garlic in olive oil, and finishing it off with fresh parsley, lemon juice, and parmesean. The "sauce" was almost done before I pulled a bag of tortellini out of the freezer - I forgot that all I had was spinach tortellini, and suddenly my dish turned very monochromatic. Anyway, it was pretty good, but I didn't take detailed notes, and it wasn't extraordinary, so the picture languished and I never mentioned it. This salad was inspired by a winter salad I had at Blue Smoke during restaurant week. I ordered the salad as an afterthought, thinking that it would be nice and light in contrast with the BBQ ribs I ordered for the main course. But the salad itself was something of a revelation. It was listed as having arugula, kohlrabi, and some other stuff I didn't remember, and there were these delicious little half-orbs of... something. I couldn't figure it out - they were bright white, about the size and shape of a large grape cut in half, and they were so sweet I thought they must be some sort of exotic fruit. Yet they were also layered, like onions. Mystical sweet onion fruit, maybe? We got our menus back to order dessert and I saw the third ingredient of the salad was in fact onions - cippollinis to be exact. I asked the waitress how the onions were prepared and she said they were roasted in their skins. Such an interesting idea - it would explain the concentrated sweetness, and also the complete lack of browning. So I decided to try and recreate the salad myself. I found some red cippollinis at the Greenmarket, but I couldn't find kohlrabi at either the market or at Whole Foods, which derailed my plans a bit. Instead I bought a parsnip, which I cut into batons and roasted with melted butter and honey (with some inspiration from Thomas Keller. I wasn't really sure what to do with the onions so I just tossed them with some olive oil and salt and roasted them at 350F until they started to explode out of their skins. I let the onions cool, then I peeled them and cut them in half and assembled my salad - baby arugula, the roasted parsnips, the onions, and some sprouts. To imitate Blue Smoke's dressing, a "habenero-lime vinaigrette," I used lime juice, lime zest, white wine vinegar, olive oil, and a few drops of hot sauce. The dressing was fantastic and I will definitely make it again. But the salad? It wasn't as good as Blue Smoke's, and the time and effort involved to roast 2 vegetables and peel all those little onions was not really worth it for the payoff. I think part of the greatness of the original lies in the contrast between the crisp, raw kohlrabi and the sweet onions; my parsnips were sweeter than the kohlrabi, and my onions never got as meltingly sweet and un-sharp as I hoped, so there was less contrast between the different elements of my salad. Don't get me wrong, it was one of the most composed salads I've ever made, and it was very good, but I don't really see myself making this one again. Hah, wow, I thought I'd say a few words about each of these dishes, I had no idea this post would get so... long. But to go back to my original point, I'm not sure any of these dishes deserved their own blog posts. How do you make the decision? A few weeks ago, I spotted a recipe for red lentil soup in the Recipes for Health section of the NY Times. I've had an unopened bag of red lentils sitting in my pantry for as long as I can remember - I think I heard or read that they cook faster than green lentils, and the word "fast" was all the motivation I needed to pick some up. But when it came time to actually cook with them, I was at a loss, and they kept getting shoved farther and farther back in the cabinet. This soup recipe seemed like a great way to get them out and front and center. Only problem is, I forgot to bookmark it, so I had to search for it again when I wanted to make it last night. I googled red lentil soup nytimes and the first result was this recipe, published in the regular food section of the Times almost a year ago. At first I thought it was the same recipe - it had the cumin I remembered, and the onions and garlic, and it was finished with some chopped cilantro (which always sticks in my mind because I know that I'll never make a cilantro-ified recipe the way it's meant to be, because I am one of them). But a few things seemed off. I could have sworn the recipe I originally read had curry powder and mentioned swirling in some yogurt. After sitting there confused a while longer, I did a more thorough search and realized that there were in fact two different red lentil soup recipes in question, written by two different people, appearing in two different sections of the Times almost a year apart. However, there were some striking similarities. I took this as a good sign, because I imagine the chance of two people reaching the same conclusion (and deciding the conclusion was fit to print) when their soups are in fact kind of crappy has got to be slim. So... which recipe did I follow? Well, both, and neither. I mixed and matched from the two to fit my mood and what I had on hand. Instead of chopped cilantro and lemon or lime juice, I made a sort of gremolata/pesto thing from parsley, raw garlic, lemon zest, lemon juice, and a little olive oil, and I added it at the end with a dollop of Greek yogurt. The soup tasted a little flat before these additions, but the lemony yogurty tartness turned it into one of the best soups I've ever made. 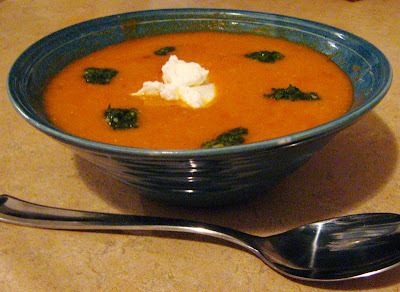 (I realize I haven't posted enough for you to know this, but: I have made some pretty awesome soups.) I got a brand-spankin'-new immersion blender over the holidays, so I blended my soup into oblivion, but it's probably good left chunky too. I was way too blender-happy to find out. My mish-mashed recipe is below. Heat the oil in pot over medium heat and add the onion and carrot. Saute until tender, about 5 minutes. Add the garlic and saute a minute longer, stirring so the garlic doesn't brown. Then add the tomatoes with their juice and all the spices, including a pinch each of salt and pepper. Let the tomatoes simmer until they begin to break down, 5-10 minutes. Add the broth and lentils and bring to a boil, then cover and lower the heat. Let the soup simmer for 30-40 minutes, until all the vegetables are soft and the lentils begin to fall apart. Season with salt, pepper, and cayenne to taste. While the soup simmers, make the gremolata/pesto topping by finely mincing the parsley and garlic. You could also do this in a food processor, but I didn't want to get mine dirty, and I actually liked the "rustic" (read: uneven) texture I got from chopping by hand. Add a pinch of salt to the parsley and garlic. Zest and juice the lemon half and add a bit of zest and juice to the other ingredients, then stir in 1 tbs of olive oil. It should come together in a paste at this point; if not, add a little more oil. Taste the mixture and add more salt, lemon zest, or lemon juice if you want. Keep in mind that this will get stirred into the soup, where the sharpness of the garlic and the tartness of the lemon will be subdued, so your mixture should have a lot of kick to it. 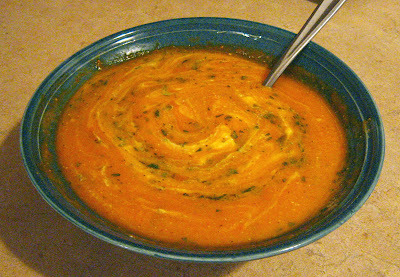 When the soup is finished, blend it with an immersion blender or in a regular blender in batches (CAREFULLY - I speak as someone who has splattered hot soup all over the kitchen before and it is not fun). It should turn a really pretty orange color. Taste one more time for seasoning, then spoon it into bowls and top each with a dollop of yogurt and a few spoonfuls of the gremolata/pesto mixture. Make sure to swirl it all together before eating! 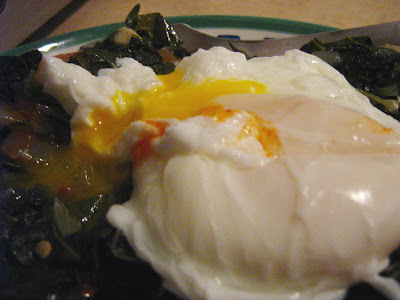 Have you made this boiled kale yet? (Recipe from the first link.) If not, drop what you're doing and go make it now. And if you have, you understand the appeal of this dish, and, well, you should probably go make it again. I know I will. The genius of this dish lies in the layering. The kale by itself is really good - I usually saute it until it wilts, and eat it when it is still bright green and just a little bitter. When it's cooked longer in liquid, the color fades, to be sure, but so does the bitterness. At the same time, the broth gets infused with the crisp flavor of the kale, the sweetness of the onions, and the bite of the garlic. (And the hot pepper flakes too, if you have them, but I had run out so I added some Cholula hot sauce at the end.) This could be the basis of a great soup. 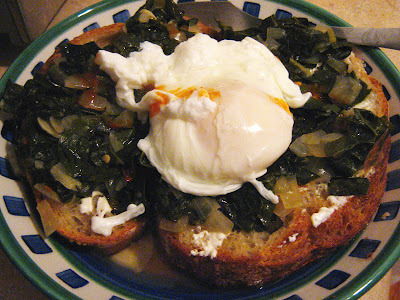 Instead, the kale gets scooped onto garlic-rubbed toast (tangy sourdough from Amy's Bread with a thin layer of goat cheese spread on top, if you are me). The bread soaks up the flavorful broth just enough to soften up without getting mushy, providing a nice textural contrast with the kale. And then on top of it all, there's an egg - poached or fried, whatever you prefer - with its yolk runny enough to mix with all the layers below and tie the dish together. I skipped the cheese grated on top because it seemed extraneous at that point. Seriously, this is awesome. It's hearty, comforting, healthy, filling... the perfect antidote to the early-onset winter we're experiencing in New York right now. One more change I made, just for reference - I had some bacon in the fridge, and greens love salty pork products, so I started the whole thing off in the fat rendered out of one piece of thick-cut bacon. And then I ate the bacon. So I guess that lowers the health factor a bit, but at the same time, I got much less than 5 tbs of fat out of it, so what I sacrificed in fat-health-levels I made up for in reduced quantity. At least that's what I'll keep telling myself.